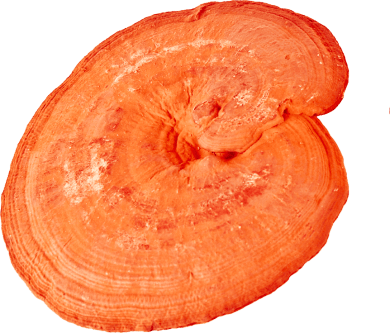 Reishi (ganoderma or lingzhi mushroom) is one of the most used medicinal mushrooms. It has been used for its vitalising effects in traditional Chinese medicine for thousands of years. 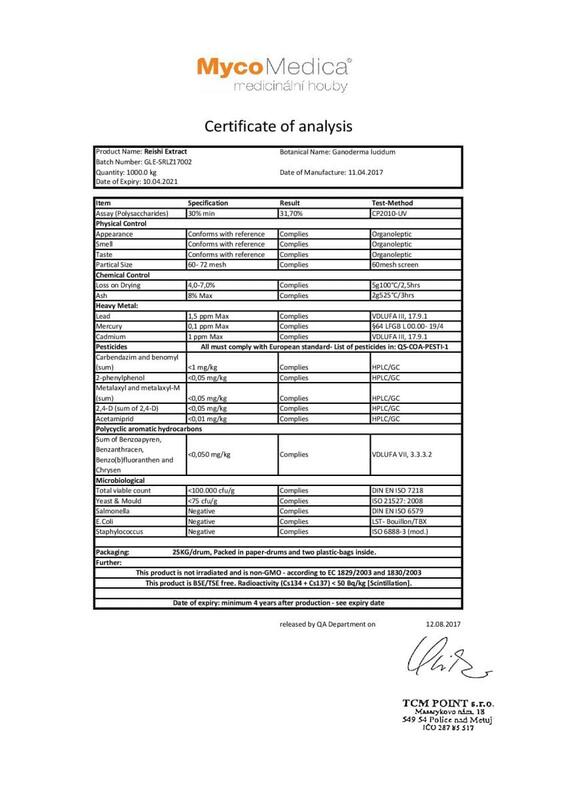 Choose the ideal ratio of polysaccharides, triterpenes and other bioactive substances for the best results. Learn more about growing our quality reishi in the article from our expedition to China. To the land where this Queen of Mushrooms comes from. The article can be found here. Compared to Reishi with 50% polysaccharides, 30% of Reishi is more suitable for chronic and serious conditions. Reishi (lingzhi mushroom, Ganoderma lucidum) is one of the most valuable mushrooms in traditional Chinese medicine. Translated, it means”divine mushroom of immortality”. Its effects have been used for more than 4,000 years. 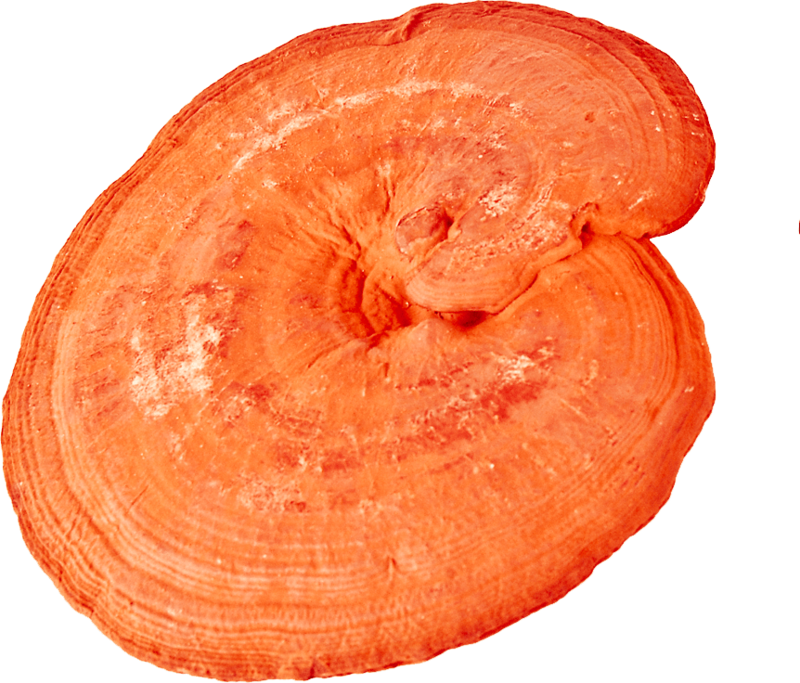 Reishi (Ganoderma lucidum, lingzhi mushroom) is a wood-decaying mushroom from the Polyporaceae family. We mostly find it on trunks of dead trees or stumps. Its sporocarps are semi-circular and usually have the diameter of 6−12 cm and they have a glossy lacquer layer, from which the mushroom’s Czech name (lesklokorka) is derived. Reishi (ganoderma) has its home in Asia where it’s also called the”divine mushroom of immortality”. It’s an integral part of traditional Chinese medicine, which has been using it for more than 4,000 years. Reishi (ganoderma) is also mentioned in the basic work of Chinese medicine, in the Inner Canon of the Yellow Emperor. It was so rare in those times that it was intended only for the emperor and his family. And it wasn’t only used in Chinese medicine, but also as a powerful talisman for happiness and protection from all evil. Monks in Taoist monasteries used Reishi (ganoderma) before meditation, for its ability to soothe the soul of Shen. It’s also used by Russian astronauts or Sherpas in the high Himalayan altitudes for its ability to regenerate and activate functions of the organism. Reishi can activate immune responses and it contributes to maintaining a healthycirculatory system. At the same time, it helps toreduce cholesterol levels naturally. Reishi contains many bioactive substances, which make it unique. Reishi, besides vitamins, minerals, also includes a great amount of polysaccharides, beta glucans, ganoderans, and also steroids, cyclic esters - lactones, triterpenes, including ganoderic acid or lanostans, etc. We use 6-9 months old sporocarps for our production, as the concentration of active ingredients is at its highest at this age. In older mushrooms, the concentration of active ingredients is gradually decreasing and the effect is less efficient. You can find more information about effects of Reishi at Mushroom Collection or in the section Effects. I‘ve been struggling with long-term skin problems. Even during childhood, I was troubled by atopic eczema, which also affected my psyche. I‘ve struggled with this problem for a long time and tried to find the best, natural solution. I encountered the Reishi medicinal mushroom and finally there was a major change. I can only recommend it. With the advent of spring, allergies worry me. Their unpleasant manifestation is mainly an irritating cough. Reishi was very good at fixing this, and I will definitely use it again. I use Reishi as a supplement for oncology treatment. I can say that I’m able to tolerate treatment better with this product. I’ve been very tired of late. I began feeling fatigue after a longer illness and I was unable to rid myself of it. My friend recommended Reishi, which solved her fatigue problems. At first I didn‘t really believe in its effects, but in the end taking the capsules regularly relieved fatigue. I can recommend Reishi from personal experience. I had problems with insomnia, and the Reishi mushroom helped me solve it. Thank you. After problems with the urinary tract, which I dealt with by using antibiotics, there were problems with impaired immunity. Weakened immunity has led to greater susceptibility to all illnesses. Since I work in kindergarten, I’ve always managed to catch a cold or cough from the children. I decided to strengthen my immunity with Reishi from MycoMedica. The effects of the mushroom were apparent very quickly, and since I’ve been using the medicinal mushroom I‘ve had no problem with illness. I'm very happy with Reishi. I’ve had lung radiotherapy and the use of Reishi has helped me a lot. I can only recommend it. I’ve had a rather long and complicated delivery, whereby I felt extremely tired. I was looking for a natural remedy that would strengthen my body to help it get back to normal as soon as possible. Thanks to Reishi, I feel much better and I'm full of strength. I ordered Reishi to strengthen my immunity. I have to confirm that it really does work. I‘ve ordered another pack. My daughter has a problem with eczema, we‘ve tried many different measures, but they were all unsuccessful. I decided to order Reishi. I started to see visible results after the first pack, so we continue to use it and hope the effects will continue to be so encouraging. After Reish I sleep much better. I've had breast cancer. Throughout chemotherapy (I took Mycomedica mushrooms from about halfway through chemo) and for a while after it. I did well in chemotherapy, I wasn’t tired, I didn‘t have digestive problems and my hair grew fast. The doctors also said that everything developed very well. Now I take it after treatment. Reishi, Coriolus, and Maitake, I want to take precaution at a lower dosage. Reishi and Mycostress have been recommended by a therapist from Mycomedica. I’ve been using them for months after problems with anxiety and mild depression. Throughout use I‘ve felt much better mentally. I hope that this condition lasts even after I stop taking the mushrooms. I’ve recently had a heart attack, although I take quite a lot of medication, so I breathing harder and I often had pressure on my chest. I‘ve taken ganoderma (Reishi) for four months along with caterpillar (Cordyceps) and the situation is slowly regulating. My breathing is better going up the stairs and the pressure on my chest isn‘t so frequent. I certainly recommend it. As an athlete, I need to have a strong immunity during the season. I decided to use Cordyceps CS-4 and Reishi from MycoMedica based on the positive reviews and experience of my colleagues. Not only did I go through the entire season without illness, but I feel that my stamina has increased, my body is recovering faster and I’m better prepared for another race. I'm giving Reishi and MycoComplex to my four-year-old daughter, who was coughing for about three months, and now she's still coughing after starting kindergarten as if viruses kept coming to her. The last week she hasn’t been coughing and the virus symptoms have also disappeared. So we made adjustments on Mr Schirlo's recommendations. We eat more regularly, we have dairy and sweet. This is only difficult regarding wheat, It's in almost everything. 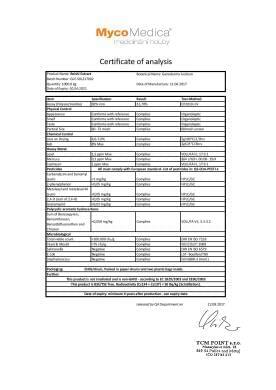 Personally, I have good experience with the combination of Reish and Agaric in children's eczema ... In 3 months, it’s basically clean. I take Reishi and Shiitake as a thrombosis prevention, which I am very afraid of. I will continue to enjoy it because I feel better overall.